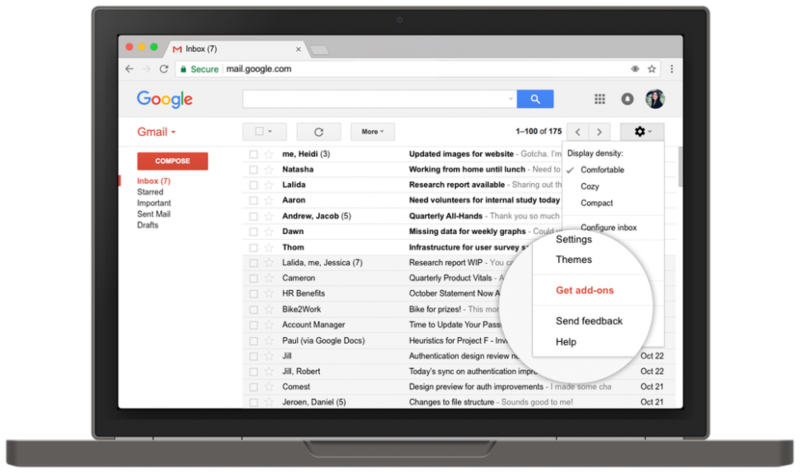 Earlier this year Google had announced that it would allow Add-ons for Gmail, and finally today, the company has launched native Add-on for Gmail. This will make the email service more engaging and business friendly. The native add-on support will allow third-party developers integrate their services with Gmail directly. The Gmail add-ons are specifically designed enterprise users which will enable them to use the go-to apps across the Web and mobile devices. Asana, Trello, DialPad, Intuit QuickBooks, and Wrike were among the initial partners. However, only Hire, ProsperWorks, RingCentral, and Streak are present at the moment. Google says that a special DocuSign add-on will be coming soon that will let signing and execution of contracts, agreements and other documents right from Gmail. Existing Gsuite of Gmail users can check out all the available add-ons from the G Suite Marketplace. Google is also including “Get Add-Ons” section that you can access by clicking settings icon from the top-right to install desire add-ons. Google has also provided the framework to the developers so that they can directly integrate their app within Gmail. The Gmail add-ons are available on the Web and Android devices; Google says that it is working on bringing them to iOS soon.